Franco Nero was going to appear in this movie, but there was a conflict in his schedule, so the title role was filled by Terence Hill (real name Mario Girotti). 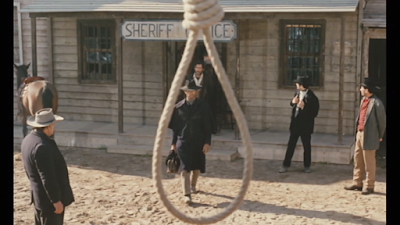 You can catch Hill in a bunch of other notable Italian westerns, including My Name is Trinity and Trinity is Still My Name. He's a great fit for this role and looks astonishingly like Franco Nero with his dark complexion and piercing blue eyes. 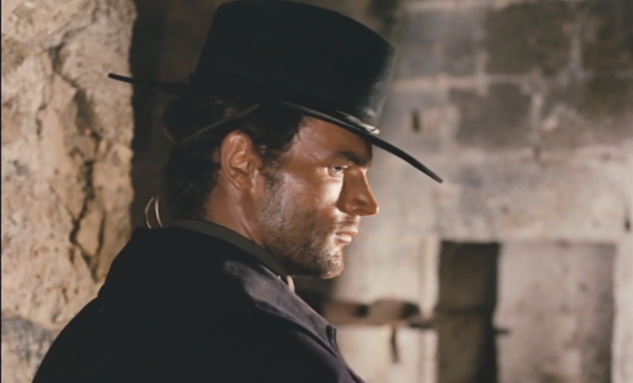 It would have been great to see Nero return to the role he originated, but Terence Hill does a great job. It's more than just a fill-in. He puts his own stamp on it in a way that feels very natural. The rest of the cast is equally top-notch. Horst Frank, a German actor who seems to be a stand-in for Klaus Kinski, has an appropriately-slimy demeanor that leaves us no question as to his morality. George Eastman cuts a striking figure as an underboss who has aspirations of power. Eastman would go on to be a huge genre star in Europe. The Italian landscapes of Preparati la bara! lend themselves to the myth of the American west, even if we're never for a second convinced that we're not in Europe, but that's part of the fun when we watch these movies: we're whisked away to a comic-book world that is larger than life. The stylized, choreographed violence seems like a close relative of the kung fu and martial arts movies that would soon storm cinemas worldwide. These movies are about escapism, rock and roll swagger, and turning death into a ballet. There's nothing particularly revolutionary or novel about this movie, which follows one of just a few standard Spaghetti Western plots. That's okay, because we're really here for the style and the action. Preparati la bara! manages to work in a corrupt authority figure, shifting loyalties, a mid-movie beat-down to the hero, and revenge that gets served up ice cold. This is all fairly standard for these kinds of movies, but it's all done competently enough and doesn't feel like a retread of other, better known, movies. 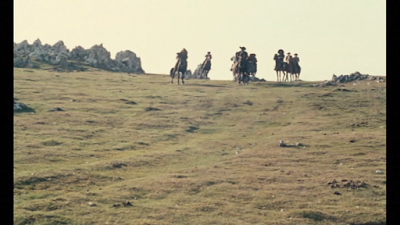 For me, one of the real draws is the excellent visuals thanks to Enzo Barboni, the cinematographer behind the original Django and a whole host of other Italian genre films that include Peplum and other Spaghetti Westerns. I'm also VERY impressed with the music, which was composed by the famous Reverberi Brothers. It was this score that was sampled by the music group Gnarls Barkley for the 2006 mega-hit "Crazy." I like "Crazy," but I really love this score. Check it out for yourself! Music like this is a huge reason Spaghetti Westerns remain so iconic half a century later. I even like the title song, "You'd Better Smile," which takes the beautiful Reverberi Brothers theme and adds lyrics about the main character, a practice that was very much in fashion at the time. Is this not THE BEST MUSIC EVER?! Those horns! The bass line! The chorus of male voices! Two minutes and fifteen seconds of pop perfection. I suppose that Preparati la bara! does nothing that the original Django doesn't do better, but that's not really the point. Euro Westerns are formulaic, repetitive, and often made on small coin. We know this going in, and in return for out faith, they offer a cinematic experience that is always incredibly COOL. This pseudo-prequel has more substance than some, and thanks to a talented cast and crew, it looks like a million bucks and stars people that are impossible NOT to watch. 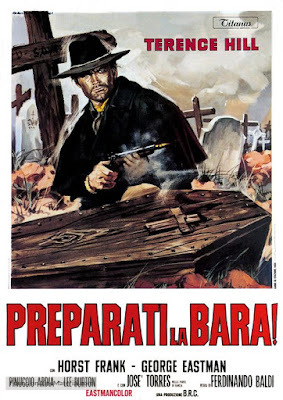 Preparati la bara! is a ton of fun. It's available on a DVD/Blu-ray combo pack thanks to the folks at Arrow Video.